Transition-metal dichalcogenides (TMDs) of the form MCh2, where M is a transition-metal and Ch a chalcogen, have received much attention in recent years. They can be stabilised as single Ch-M-Ch monolayers, which display a host of attractive materials properties including direct band gaps in the visible region and ambipolar conduction, suggesting a range of applications in electronics and optoelectronics . Moreover, they host degenerate band extrema at the corners of the hexagonal Brillouin zone, which gives rise to a so-called valley degree of freedom. A combination of strong spin-orbit interactions with broken inversion symmetry in the monolayer causes this valley pseudospin to become strongly coupled to the real spin . Valley-dependent optical selection rules combined with suppressed inter-valley scattering resulting from their coupled spin-valley texture has opened new possibilities for optical control of spin and valley pseudospins [3-5]. This suggests unique potential to exploit TMDs in novel schemes of electronics exploiting the spin (a.k.a. spintronics) or valley (a.k.a. valleytronics) degrees of freedom, with the ultimate potential for faster, smaller, and more energy-efficient devices. One might naturally expect this potential to be lost for their bulk counterparts, where the most common structure (the 2H polymorph) is formed by stacking single TMD monolayers together with a 180° rotation between neighbouring layers (other stacking sequences host their own interesting properties , but we don’t consider these here). The bulk unit cell therefore contains two such monolayers, having a centre of inversion. It is well established that such inversion symmetry, together with time-reversal symmetry, enforces all electronic states in solids to be spin-degenerate. In our recent work published in Nature Physics , performed in a collaboration between my group in St Andrews (UK) and researchers at the Norwegian University of Science and Technology, the universities of Tokyo (Japan), Aarhus (Denmark), and Suranaree (Thailand), the Max-Planck Institute in Stuttgart (Germany), MAX-IV Laboratory (Sweden) and Diamond Light Source (UK), we have instead observed spin-polarised states persisting in centrosymmetric bulk WSe2. We used angle-resolved photoemission spectroscopy (ARPES) to probe the electronic structure of bulk crystals of 2H-WSe2. Through a process of Mott scattering, we also measured the spin polarisation of the emitted photoelectrons, and discovered that the electronic states around the corners of the Brillouin zone were almost 100% spin polarised. Surely this would seem to contradict the inversion symmetry that this material possesses? 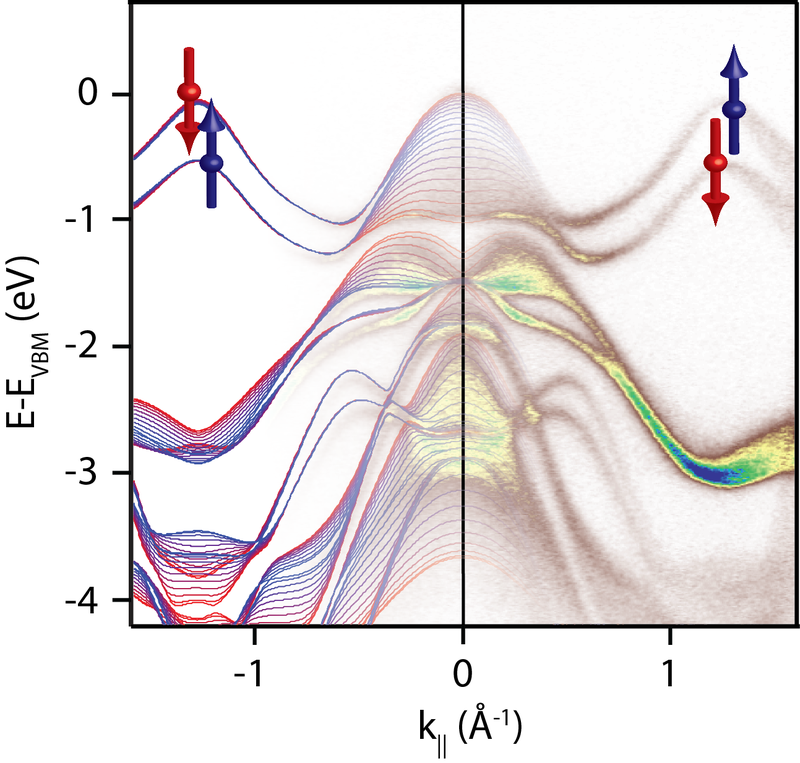 Figure 1: Valence band dispersions of WSe2 measured by angle-resolved photoemission, showing excellent agreement with theoretical calculations of the kz-dependent bulk electronic structure (coloured lines). The spin texture measured at the K and K’ points of the Brillouin zone is shown schematically by coloured arrows. Through a combination of photon-energy dependent ARPES experiments and first-principles theoretical calculations, we observed how, for the electronic states close to the Brillouin zone corners, their wavefunctions are spatially localised within single monolayers of the bulk crystal structure where locally, inversion symmetry is not present. The combination of this inversion symmetry breaking together with strong spin-orbit coupling drives these states to develop huge spin polarisations, leading to spin-valley locking as for isolated monolayers. Figure 2: Angle-resolved photoemission measurements of WSe2 throughout the Brillouin zone, schematically showing the intertwined layer- and momentum-dependent spin texture uncovered here. The 180° rotation between neighbouring monolayers in the bulk crystal structure, however, imposes an additional layer-dependent sign change of the spin polarisation for a given valley, as found in previous theoretical calculation , and recently also suggested from polarisation-resolved optical experiments . By exploiting photon energy-dependent interference between photoelectrons emitted from different crystal layers, we could tune the measured photoelectron spin-polarisation nearly to zero, effectively averaging over neighbouring layers, or could selectively probe just the top monolayer of the crystal. These measurements together provide the first direct observation of the entangling of the spin with valley and layer pseudospins in a bulk transition-metal dichalcogenide. Moreover, our study provides an experimental observation that local, rather than global, inversion symmetry breaking is sufficient to stabilise spin-polarised states in solids , contrary to conventional wisdom. This is exciting because it reveals that a whole new class of materials which we previously thought must have only spin-degenerate energy bands can in fact locally host spin-polarised states. Controlling this could bring fantastic new opportunities for spin- and valleytronics, and a whole arsenal of new materials in which we can achieve this. Qing Hua Wang, Kourosh Kalantar-Zadeh, Andras Kis, Jonathan N. Coleman, Michael S. Strano, "Electronics and optoelectronics of two-dimensional transition metal dichalcogenides". Nature Nanotechnology, 7, 699 (2012). Abstract. Di Xiao, Gui-Bin Liu, Wanxiang Feng, Xiaodong Xu, Wang Yao, "Coupled Spin and Valley Physics in Monolayers of MoS2 and Other Group-VI Dichalcogenides". Physical Review Letters, 108, 196802 (2012). Abstract. Hualing Zeng, Junfeng Dai, Wang Yao, Di Xiao, Xiaodong Cui, "Valley polarization in MoS2 monolayers by optical pumping". Nature Nanotechnology, 7, 490 (2012). Abstract. Kin Fai Mak, Keliang He, Jie Shan, Tony F. Heinz, "Control of valley polarization in monolayer MoS2 by optical helicity". Nature Nanotechnology, 7, 494 (2012). Abstract. Xiaodong Xu, Wang Yao, Di Xiao, Tony F. Heinz, "Spin and pseudospins in layered transition metal dichalcogenides". Nature Physics, 10, 343 (2014). Abstract. R. Suzuki, M. Sakano, Y. J. Zhang, R. Akashi, D. Morikawa, A. Harasawa, K. Yaji, K. Kuroda, K. Miyamoto, T. Okuda, K. Ishizaka, R. Arita, Y. Iwasa, "Valley-dependent spin polarization in bulk MoS2 with broken inversion symmetry". Nature Nanotechnology, 9, 611 (2014). Abstract. J.M. Riley, F. Mazzola, M. Dendzik, M. Michiardi, T. Takayama, L. Bawden, C. Granerød, M. Leandersson, T. Balasubramanian, M. Hoesch, T.K. Kim, H. Takagi, W. Meevasana, Ph. Hofmann, M.S. Bahramy, J.W. 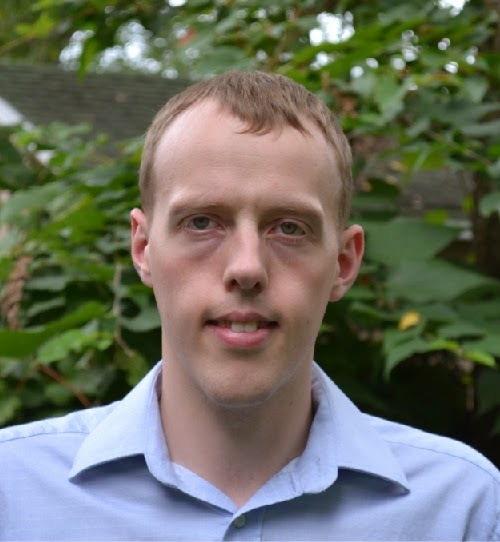 Wells, P. D. C. King, "Direct observation of spin-polarized bulk bands in an inversion-symmetric semiconductor". Nature Physics, 10, 835 (2014). Abstract. Zhirui Gong, Gui-Bin Liu, Hongyi Yu, Di Xiao, Xiaodong Cui, Xiaodong Xu, Wang Yao, "Magnetoelectric effects and valley-controlled spin quantum gates in transition metal dichalcogenide bilayers". Nature Communications, 4, 2053 (2013). Abstract. 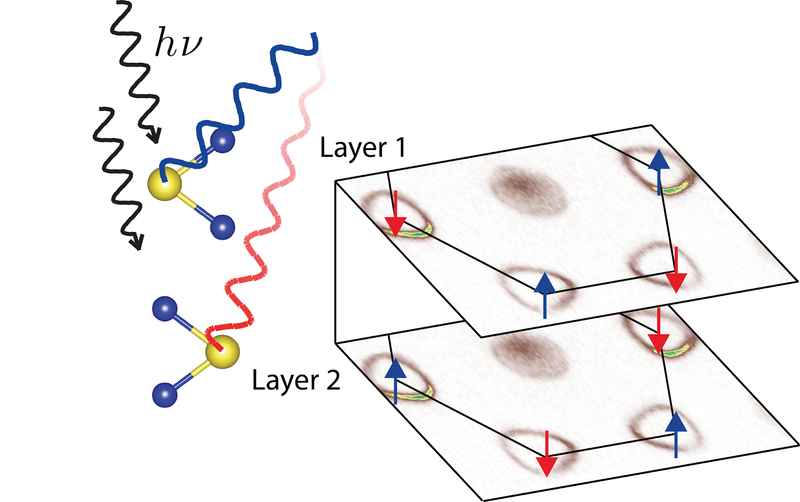 Aaron M. Jones, Hongyi Yu, Jason S. Ross, Philip Klement, Nirmal J. Ghimire, Jiaqiang Yan, David G. Mandrus, Wang Yao, Xiaodong Xu, "Spin–layer locking effects in optical orientation of exciton spin in bilayer WSe2". Nature Physics, 10, 130 (2014). Abstract. Xiuwen Zhang, Qihang Liu, Jun-Wei Luo, Arthur J. Freeman, Alex Zunger, "Hidden spin polarization in inversion-symmetric bulk crystals". Nature Physics, 10, 387 (2014). Abstract.